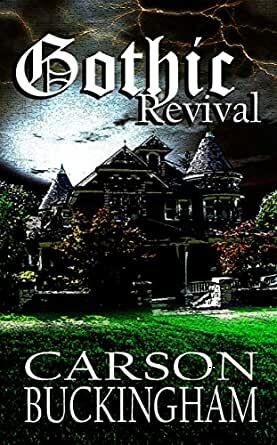 5.0 de 5 estrellasGothic Revival Is Carson Buckingham's Masterpiece! Gothic Revival, by Carson Buckingham, is the author's best work to date. One would think a 536 page novel would have some slow, drawn out sections, but not for Carson. She is a master at Gothic story-telling and knows how to keep the story moving. I am particularly impressed by the fact there is no elaborate over-description involved. To me, that is boring. Give me some action; some psychological horror. Carson gives the reader all the description she/he needs without describing every useless tid-bit a reader doesn't want to know. How does she do this? Through her skillful use of dialogue. Too many authors are totally without dialogue skills. Carson could write a non-fiction book on the subject. But then again, anyone who reads Gothic Revival will see what I'm talking about. Her dialogue is written the way people actually talk. Fancy the concept! She has hit upon a secret so simple that it eludes far too many authors. Now I come to a part of Carson's writing that I really enjoy. Her sense of humor. What, you ask, humor in Gothic horror? You betcha. Once more, Master Carson Buckingham comes riding along on her trusty steed and delivers the right amount of humor at the perfect time. Superb! Take dialogue unmatched by any author past or present, add in humor, suspense, romance, and a foreboding creepy feeling polishing it all off, and you have Carson Buckingham. You will notice my review does not tell you the details of the story. Yikes! Why do that? Read the description and the free sample for that. I'm here to tell you about the author's skills. Of that, Carson has many. Besides, I wanted to blurt out some goodies, but that would have been a spoiler. Not my style. Gothic Revival is a masterpiece! It's the first wedding anniversary of Leo and Alex Renfield, and they're finding it hard to make ends meet. After moving to Woodhaven, the couple hope to find work with their remodelling business. It can't come soon enough. So, when an eccentric woman named Theodore Hamilton offers them a painting job at her home, one involving a serious wad of cash, the Renfields have to decide whether the strange requests accompanying the job are worth the trouble. It's odd enough she wants them to paint at night, but when they find themselves at the disgustingly expensive home of the Hamiltons', things get a whole lot worse. Contracts are signed, and Leo and Alex return home. Out of the ordinary (and frankly quite scary) things begin to happen. Alex's hand is taken over while writing, Leo is talking to himself, and entire places in Woodhaven are suddenly abandoned ... Or were they ever occupied in the first place? Not to mention the things going on with their turtle! At the home of Theodora, the Renfields find themselves deeper and deeper in a troubling world. In the last one hundred pages, the weaving of the story is pulled together with a masterful thread. With soft echoes of Ray Bradbury's Something Wicked this way Comes, Gothic Revival is one of the best books I've read in many years. Buckingham is clever, witty, and builds suspense like a pro. The story is spun through dialogue, and just when you think, `okay something needs to happen now,' it does. There are laugh out loud moments that make Gothic Revival a little bit addictive, and the characters are developed so well, they'll stay with you long after the last page is turned. 4.0 de 5 estrellasAnother ingenious effort by Carson Buckingham, enjoyable in all ways. Her sky wink at The Haunting of Hill House reminds the reader that, as her story unfolds, we are in the company of another master. A well-designed read that invites you to care for the two main characters, so that even if you figure out where the plot is going (and you won't), you will stay with it 'till the end. 4.0 de 5 estrellasInteresting Book! Not quite the ghost book I am used to, but it was weird and strangely compelling. The writer has good writing abilities, but at times, becomes a little long winded. I found the beginning of the book a little boring, but as the readings continue, it was okay. Strange adventure for a ghost book, but I recommend it for ghost readers that want an unusual format. Enjoy!